Well, everybody- I finally took the plunge. I'm on Flick'r! I really kind of love it! I thought it was going to be this giant hassle, but it was actually really fun! Most of the pictures are aligned with my wedding planning blog, Holy Matrimony! : Life, Love and the Pursuit of the Perfect Wedding, but eventually there will be just as much party planning deliciousness located there. I intend to start with some lovely paper pinwheels. I'm not done with the surprises yet, so you'll have to stay tuned. 1. Never underestimate the beauty of the signature drink. Oh, the signature drink-what a beautiful thing! This is a great way for Brides on a budget to save a little money while amping up the personal touches that make a reception great. Choose a drink you and your SO really like, give it a fun, flirty name and voila! A signature drink is born. Then, serve your guests soda, coffee, champagne for the toast and your signature drink. Also, consider making a colorful sign to announce your drink at the bar. Here's a drink idea to get you started! 3. Consider the password. This can be used like a drink ticket/token, but less obtrusive. 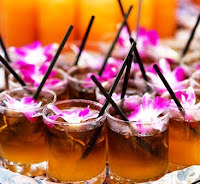 Perhaps you'll want to limit the number of free drinks for the entire guest list (two or three seem to be most common). Unlimited drinks for a small group of people (think bridal party, parents and a few close family and friends) is completely acceptable as well. Make the password simple and relevant to the wedding (think last names or the date of the event). Whatever you do, make it fair. Do not choose a group of people who, to a guest outside that group, seem to be chosen at random. Make the group and the reasoning behind it crystal clear. Confusion is usually not an element of an unforgettable wedding. Holy Matrimony! is on Flick'r, folks! A woo-hoo, I say! On my photostream, you'll find pictures of the Bridal Shower, Snow and Graham, and any other topic mentioned on the pages of Matrimony! Updates will be frequent and totally worth the look-see. By the way, I'm not done with the surprises yet......you'll have to stay tuned to get your fix. "What advice can you give me about reducing the cost of the bar? I want our guests to enjoy themselves, but everything is adding up so fast-we really need some help keeping our liquid costs down." Liquid costs are sometimes the last thing on a couple's "wedding mind". It just not something everyone thinks about, we didn't. Not until very late in the game, at least. I'm not going to lie, the navigation of liquid cost is a tricky business. Luckily, I have a few tips and tricks at the ready. 1. Do your homework. Get familiar with any literature you have from your catering and/or venue candidates. Go to their websites and check out references. The best thing you can do is talk to people who've used them. See what problems if any other couples have had. If at all possible, talk to a local wedding planner and ask them for recommendations. In other words, know as much as you can about the place you will be visiting before you even set foot on the grounds. The Hubbs and I searched for at least 6 weeks before coming to a decision. It's a lot like dating. You gotta let 'em work for it awhile, before you go giving it up. 2. Ask Questions. When you are venue-hunting, take a list of questions along with you (more on this in a different post). Write down everything you want to know, no matter how silly you think your inquiry may be. You can't have too much knowledge, especially when it comes to money. Sample topics: Bartender fee, gratuity, tax, drink price and per bottle prices. Make sure you ask what bottles are included with your bar and how much upgrades are. For instance, Stoli may come in the bar, but it may cost $10 to upgrade to Grey Goose. Do not leave that venue until all of your questions have been not only answered, but answered to your satisfaction. This is what ONE of our question lists looked like. We had seven lists. I love parties. I love everything about them and I've gotten to be pretty darn good at hosting them. Along the way several people have asked me for my advice. My answer usually hinges on the type of party in question. However, Lately I've been thinking a lot about my personal party planning philosophy. I always seem to fall into a routine when executing a party. I've decided there are six tips in particular that can lead to the success of virtually any party. So, my first post here at Renegade Soiree will be all about them. 1. Pick a theme. This is one of the most valuable weapons in my party arsenal. Centering your event around a theme can serve you immensely and help to stimulate your creativity. You'll be surprised at how easy creating a menu and choosing decor can be when you have a brilliant theme to inspire you. Not to mention you'll be less likely to get overwhelmed by the stress of having too many options! My events are usually centered around classic ideas with a fresh, modern twist. Remember, the best events regardless of theme are smart and subtle with a few larger than life elements that give us just the right amount of drama. 2. Create a timeline and budget. Once your theme is set figure out the logistics. Decide what must be done and apply it to the time you have. Even the most skilled host may not be able to pull off a five course meal in 48 hours. The sordid topic of coin can often be a downer (at least it can be for a newlywed in her mid-20's) but it is something that should be discussed. It's best to prepare yourself for monetary surprises right away-otherwise when your party takes an unexpected turn panic will inevitably ensue. Panicking is neither stylish nor fun. The bottom line here is, your time and money are linked whether you like it or not. One always influences the other. 3. Start your shopping early. After you've tamed the time/money continuum, you are ready to shop. I start gathering the pieces of my party as soon as I can. Doing this will allow you the time you need to get everything together, lay it all out, and survey your finds. You have the time to return those things that fit neither budget nor theme. With early action, rush shipping charges can be avoided and everything will arrive on time and stress free. 4. Become besties with the "trial run". Trial runs are the best way to ensure everything works together. The best events have a certain air of harmony and you can bet trial runs were involved. I try to preview my menu choices on an unsuspecting audience (usually The Hubbs or people who work with The Hubbs) the week before. I always have time to regroup if menu changes are needed. Set up any decorations you may have, including centerpieces. Stand back, take a good look and decide. Again, time will be on your side if you desire a redesign. 5. Delegate when necessary. Hosts are busy people. With jobs to conquer, households to run, and social lives to navigate-there isn't a whole lot of time left for party planning. When a potential guest offers to help give yourself permission to let them. Helpful friends are wonderful and always right there when you need them. Be sure to help your friends help you, however. Be crystal clear about what you need. Are they bringing a dish? It might not hurt to lend them the pan to put it in. Likewise, don't force a helpful friend to do something out of their comfort zone. They may not feel comfortable crafting the only dessert or single-handedly arranging the centerpiece. Always thank your friends after the party. Let them know their thoughtfulness and generosity did not go unnoticed. 6. Take time to enjoy your party. How many times have you attended a party and your only interaction with the host is a series of near misses with a smartly dressed puff of smoke? We've all been there. We take care of the guests, empty the trash, restock the beverages and completely neglect ourselves. Imagine the party starts about an hour before it truly does, finish readying everything before the guests arrive,then give yourself some time to relax. Sit down, have a cocktail, and treat yourself like a "guest" for a bit. You'll find a relaxed host is more likely to be a charming host. Stations, stations, stations! To cut down on stressful traffic jams don't put the food and beverages all in one place. Set up various stations to encourage mingling and you'll notice traffic will settle into a natural flow that is much less stressful for everyone. This was just a general approach to party planning. I wanted to outline a little bit of my philosophy without losing the message in a bunch of exciting (and distracting) ideas. Want more? Stay tuned as we cover some of these points in more detail. In fact, I'm cooking up the first party of the summer and I have LOTS of wonderful decorating ideas and more planning tips than ever! Hello everyone, welcome to Renegade Soiree! As you can see I am shaping my little piece of Blogosphere into something we can work with. It may take a couple of days to get this up and a-runnin'-so bear with me! If you can't get enough planning goodness, check out my other blog: Holy, Matrimony! : Life, Love and the Pursuit of the Perfect Wedding. It's a hoot, I promise! So, Kate. Milwaukee resident and friend of mine has a cat. His name is Annoying Customer, or AC for short. AC runs a blog and it's marvelous! This pretty kitty is the subject of several of Kate's creations. She has an extensive line of cards and invitations featuring the little black dynamo. Anyway, Ms. Funk has just issued her Spring 2009 catalog. You can find it, here. It's super cute! She has several boxed card sets available as well as party invitations. All handmade and all brilliant. The catalog itself is wholesale but I think you can get a good sense of her collection. The products and retail prices are available on her Etsy Shop. If you're in the Milwaukee area, you may find her products at Fasten Collective on Kinnickinnic Avenue or at Broadway Paper. In Illinois, she can be found at Renegade Handmade. She also has a really great Etsy Shop, which might be the easiest way to satisfy your craving for Kate Funk products. Please tell your friends, families and neighbors about this great local artist! I'm in love, I'm in love and I don't care who knows it! 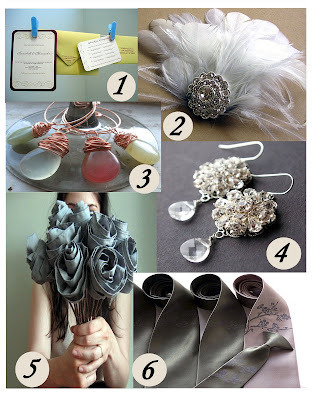 I've got a lot of deliciousness for you today...invites and feathers and agate, oh my! 1. This beautiful invitation suite comes to us from green quince. The colors are chartreuse and a deep, beautiful burgundy (tres chic!). Everything is flat printed, but you'll find gocco screen printing on the envelopes. The suite shown here is $375 (which includes 100 ea.- invite (5"x7"), an A7 outer envelope complete with return address and a reply card/envelope). All assembly is done by the crafty gal behind green quince. She's completely custom as well, perfect for the choosy Bride. Most of the materials she works with are recycled and she is always on the watch for materials made with 100% Post-Consumer waste. She's located in the Oakland area, check out her Etsy Shop for full details and shop policies. Photo belongs to green quince. 3. These beautiful Agate Briolette Drink Charms are maybe my favorite item of the day. Tinahdee makes wonderfully beautiful jewelry with an array of materials. These charming little drink charms are made of shined, agate stones and wrapped with copper wire. At $30 (plus shipping, of course) for a set of 4, they might be a bit pricey, but totally worth it. Perfect for bridesmaids' gifts. I also think they'd be nice worked into boutonnieres or bouquets. Go to the Etsy Shop for details! Photo belongs to tinahdee. 4. Next we have the Elizabeth Earrings from Etsy seller, luxe deluxe. Made with genuine Swarovski rhinestones the flower pendants are set into antiqued silver plated filigree. A Swarovski briolette hangs as the focal point on each earring. The Elizabeth earrings are a bargain for only $68.00USD. This is the matching necklace. There are several variations on this particular style and all of them are gorgeous! Check out the double strand Elizabeth Necklace. Beautiful! Get on over to her Etsy Shop! The only thing I will say is prepare to pay a little more in shipping as this shop is located in Edinburgh and all shipping will come from the UK. Photo belongs to luxe deluxe. 5. Next up, we have these charming Charcoal roses from seller Allen Company Inc. Made of silky microfiber fabric and mounted on real vines and branches with silver wire, these roses will run you $150 (plus shipping) for a set of 24. I love these! I think they'd be perfect for any Bride looking to add romantic, vintage accents to a more modern look. Also, a fabric bouquet was just made for preserving......I'm thinking you could fill one of those clear glass lamp bases with them (after removing blooms from stems) or one might put a couple lovely blooms in a chic shadowbox along with other memorabilia from your special day. Ah, beauty. This clever little company is located in eastern Pennsylvania and you can travel to her Etsy Shop for details and policies. P.S.- She takes custom orders! Photo belongs to Allen Company Inc.
6. Finally, something for the guys! These microfiber ties from Detroit based seller Cyberoptix Tie Lab are smart, chic, and a perfect way to add some color to the guys without the all the schmaltz. The Hubbs even likes them! Shown here in the ridiculously Delicious seafoam/rose combo, this set of 4 ties costs just $108. Shockingly inexpensive when you think of what you'd pay for some of the lower quality stuff in the stores. The best part?! They're handmade-which means on top of everything, no one will ever have the exact same thing. Check out other offerings here and here! Oh, and these too.....delish! They are willing to work with you on design and color scheme. Cyberoptix also has several group rates on ties for weddings (love, love LOVE them!). Perfect for the man with style! Go to their shop for details and policies. Photo belongs to Cyberoptix Tie Lab. Now, for a few "dos and don'ts" that may aid you in your Etsy travels. Do read the Shop Policies on each seller you visit BEFORE placing any orders. This is important folks, because every seller is different and a "do" in one shop could very well be a big 'ol "don't" in another. Unsure? Ask. Use the convo tool-always. Most sellers will require you use it for consultations on custom work anyway. Do establish a working relationship early on. They want to help you, but you've got to meet them half way. Do ask all of your questions! Even if you think it might be a stupid one. If you leave something unclear, you may be very sorry later. Do be polite at all times, especially when placing a custom order. Be sure to give the seller as much information as you can up front-They are very busy people and are not mind-readers! Don't be inflexible. If you are told your idea won't work exactly the way you pictured it, it's because it won't. These people are brilliant designers and artisans, not miracle workers. Believe you me, they know what they're talking about. Don't expect shipping miracles. Plan in advance your timeline. Give your seller the ideal ship date before placing your order. Ask them if it's possible, beause if it isn't you may need to regroup. You've chosen handmade items for a reason. Don't rush your artisan-they can't bend the space-time continum just because you waited too long to order. Most importantly, do have fun! Esty is a wonderful place and I haven't met a single inhospitable seller. It's a great experience and you can't believe how good buying handmade can feel! All photos owned and copyrighted by the corresponding Etsy seller. They are great pictures, I know, but don't reproduce and don't copy. It's not nice! If you must use- please give credit where credit is due. You didn't take those pictures and neither did I. More on Save the Dates! My last post was a lot of words. Today, I have some pictures for you. Here we go! This comes to me from my friend Kelly. She and Blake will be married in August. What can I say? I LOVE this. Notice the simple wording- names, dates, and "invitation to follow". That's all you need. The picture is adorable. They look so happy and Kelly looks beautiful in blue. The design is perfect! It's flirty, fun, and I absolutely cannot wait for August 16th. Remember what I said yesterday about leaving your guests wanting more? This is what I meant. I think this is a great example of functionality and artistry. The best part?? She did these herself! That's right, my crafty little friend drew these up in Photoshop. They were printed on high-quality photo paper and sent in a sweet little envelope (Which I don't have for you b/c The Hubbs threw it away). These cards measure 4x6 a standard postal standard, but these could easily be made into postcard size. This would save both paper and postage. I think this is huge for bargain-savvy brides! This shows us that with a little ingenuity and an eye for color and design, we can take control of our weddings and save a little money doing it. This one is ours. 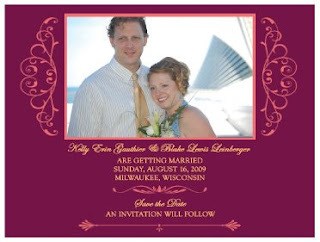 Yep, this is your first glimpse of the Burgess/Ellingen invitation suite. Again, we stuck with the simple wording. Names, dates and "invitation to follow". We went with a big, bold format to really catch the eye of the recipient. I chose a square shape to make it stand out even more from the mail one usually receives. The design is simple but elegant and, I think, accurately gives our guests a taste of what's to come. Our biggest challenge was amping up what can usually be a casual announcement to fit the theme of the formal evening wedding we were having. We also had a lot of out of town guests so these went out in two waves. Out of towners first, then locals. Our cards were designed by my friend/Bridesmaid Allison. They were thermographed by Paper Envy here in Milwaukee....well rather, Elm Grove (more about Paper Envy as we roll along). These were a little more expensive, but by having our friend design them and buying our deliciously shiny paper in bulk, we really did save quite a lot. Save the Date cards are necessary. More impotantly, they're exciting! Have fun with them! Announce your wedding with a bang! Save the What?!.....Date. That's what. If I had to pick the question I get most often- it would have to be, "Do I really need Save the Date card?" This question would usually be followed by, "Are they necessary.....I mean it's just another expense, right?" My answer is always the same. It goes a little bit something like this: "Don't we want to do all we can to assist everyone we've invited in attending? Look, truth is everybody's busy. Everybody. So, it stands to reason the more lead time they're given, the more likely they'll be able to attend." Now, I'm in no way suggesting that you run right out and buy letterpressed, solid gold save the date cards. There are so many things you can to do save a little green while your guests are busy saving the date. Magnets and postcards are two of my favorite ideas and are perfect for the Recessionista. My piece of advice? Well, today you get more than one. 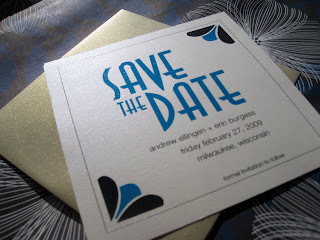 First, your Save the Dates should hit the mail approximately 2 to 4 months before your invites go out. So, in real people time, about 4 to 6 months before your wedding. I'd say for those of you having destination weddings stick with six months. Use your judgment.